Cerebral palsy (CP) often includes motor impairments. Recent evidence suggests that children with CP may improve motor performance when provided with constrain-induced movement therapy (CIMT). 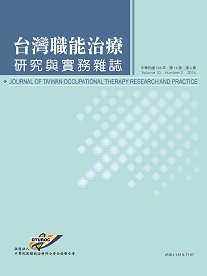 While previous studies employed clinical measures to evaluate the efficacy of CIMT, this study attempted to use kinematic analyses (the spatio-temporal analysis of movement) and clinical measure to investigate the effectiveness of modified CIMT (mCIMT) on reaching performance in children with CP. Sixteen children (mean age=71 months old) with spasticity associated with CP were randomly assigned to receive either mCIMT or conventional intervention. The mCIMT program involved constraint of the less-affected upper extremity for 3 hours/day and intensive training (using shaping) of the more-affected upper extremity for 2 hours/week during the 3 weeks. The conventional intervention involved bilateral and the more-affected upper extremity training for 2 hours/week for 3 weeks. The effect of the mCIMT in the spastic CP was measured by using kinematic analysis (spatio-temporal analysis of movement) and clinical assessments (MAL and BOTMP) just prior and after intervention. After 3 weeks intervention, there were no significant differences in kinematic variables. However, children receiving modified CIMT compared with those receiving conventional treatment showed better reaching performance (i.e., a greater percentage of reach where peak velocity), and acquired more significant improvements in clinical measure. The results also revealed no temporal dysfunction of the less-affected hand after 21 days constraint. This is a preliminary research. The results revealed positive efficacy of mCIMT for children with CP with asymmetric motor impairments. Future research should increase sample size, and combine the mCIMT with other medical treatments (i.e., BoTox) to determine the effectiveness of the mCIMT for spastic CP.